Nilit will once again sponsor and be on display in the ISPO Brandnew area at ISPO Munich, which takes place from 3-6 February, with its beautiful capsule collections and Textrends 20/21 award-winning fabrics. Nilit created Sensil in response to the rapidly expanding influence of Millennials and Gen Zers, who are forever redefining the face of the marketplace. These consumers have a long and growing list of demands for their apparel. High-quality, multi-tasking, and long-lasting rank at the top along with comfort, function, and style. Nilit will display in the booth the award-winning ISPO Textrends 20/21 Sensil fabrics. RVB created four fabrics featuring Sensil Breeze and Innergy that were picked as Top 10s or Selections in the Second Layer category. Billion Rise designed a Top 10 Base Layer fabric winner with Sensil Breeze. Payen earned four Selection awards for its Second Layer fabrics built on the performance benefits of Sensil Breeze, Aquarius, Innergy, and BodyFresh. Texollini won three Second Layer Selections for its Sensil fabrics made of BodyFresh, Arafelle, and Black Diamond yarns. Schoeller’s Sensil Heat fabric attained Selection status in the Outer Layer category. Visitors are invited to come hear the story of the Donna Moderna Negev Desert Adventure sponsored by Nilit. Hundreds of women participated in training programmes throughout Italy that culminated in five finalists selected to participate in a three-day, 80K run through Israel’s beautiful but extreme Negev Desert wearing special performance apparel made by BV Sport of Sensil Innergy fabric. The finalists share their stories on the ISPO Stage on 5 February and describe the factors that helped them break through personal boundaries and mind-sets to achieve their goals. The conversation will continue at a reception with the athletes at Nilit’s booth in the Brandnew Village. Nilit will sponsor the ISPO Academy Masterclass, a global design project developed by international textile design consultant Nora Kühner to help talented young designers interested in the sports market understand the importance of selecting the ideal fibres and fabrics. Through a series of lectures, project work, and presentations, the ISPO Academy Masterclass event encourages these designers to break with the norm, apply critical thinking skills, and embrace novel approaches to merge fashion and function to transform performance apparel. The six critical fashion, fabric, and lifestyle trends that will shape the Autumn/Winter 2020/2021 market will be debuted in the latest Nilit Trend Book. 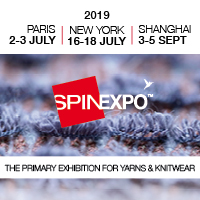 The concepts and the newest commercial garments and fabrics to inspire and excite fabric producers and apparel brands and retailers will be on display in the Nilit booth.